Wenn man(n) Glück hatte, bekam man sie geschenkt, ohne eine BOSE Anlage kaufen zu müssen. Der Händler jedoch, der mußte oder sollte sich ein paar davon hinlegen und (an die guten bzw. potentiellen BOSE Kunden) verteilen. Man muß der Platte (bzw. 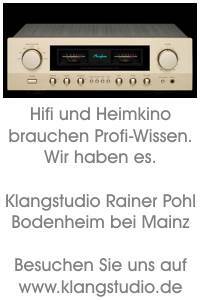 der Firma Mercury Records und dem Sponsor BOSE natürlich) neidlos zugestehen, die Musikbeispiele waren sehr gut ausgewählt und vor allem - mit den BOSE 901 in optimaler Aufstellung - absolut beeindruckend. Auch die Warfdale Platte ware damals ein gutes gelungenes Vorführmuster der besonderen Art und die von Soundscraftsman auch. Die Beschreibung auf der BOSE Platte ist natürlich in Englisch für den Weltmarkt gemacht. Ich habe nie herausbekommen, wieviele hunderttausende davon gepresst wurden und vor allem - kostenlos verteilt wurden. An adventure in spectacular stereophonic sound. - 11 exciting excerpts (beeindruckende Auszüge oder Teilbereiche) from Mercury Records that demonstrate what the BOSE 901 can do. Kodaly - Hary Janos Suite (from record #SR90132) Antal Dorati cond. the Minneapolis Symphony Orchestra. Beethoven - Piano Cone. #5 (Emperor) (from record #SR90321) Gina Bachaeur, piano. Stanislaw Skrowaczewski cond. the London Symphony Orch. Bergsma - Gold and the Senor Commandante (from record #SR90147) Howard Hanson cond. the Eastman Rochester Orch. Moussorgsky/Ravel - Pictures At An Exhibition (from record #SR90342j Howard Hanson cond. the Eastman Rochester Orch. Rimsky-Korsakov - Russian Easter Overture (from record #SR90265) Antal Dorati cond. the London Symphony Orch. Die ganzen Test-Platten hatten jetzt bis 2017 im Schrank gestanden, senkrecht natürlich und auf dem Innenschuber hatte ich mir damals Notitzen gemacht. I think that you might be interested in the following technical notes concerning this record. After Bert Whyte selected the excerpts, we went back to the original 3-track master tapes and made new 2-channel transfers using the Dolby A-301 noise reduction system. In making these transfers we did not attempt to "tailor" the music in any fashion to the Bose loudspeaker system. Rather, our aim was to make as flat a transfer as possible, adjusting overall levels and the levels of the center split on a band-to-band basis. A Westrex 3-D cutting system (also keine Neumann Schneidmaschine sondern eine von Westrex) was used in the master lacquer transfer with no additional equalization, filtering, or compression. As a result, we have a record which exhibits the wide dynamic and frequency ranges which the modern stereo disk is capable of. This is especially apparent in the region below 50 Hz, where so many manufacturers choose to use a high-pass filter, thus depriving the music of so much of the impact contained in the original recording. The disk should certainly be played with one of the handful of state-of-the-art phono cartridges, since their vertical tracking angles match the effective cutting angle of the 3-D cutter. This angle, incidentally, turns out NOT to be 15 degrees but rather is closer to 20 degrees. The optimization of both recording and playback actions will be apparent in playing the last band on both sides. Both the Kennan and Bennett excerpts exhibit complex musical textures in a close-in recording environment, and their utter clarity is testimony to the fidelity of the disk media at its best. Finally, we should acknowledge the quality of the pressings, which are characteristic of the output of the new Philips plant in Richmond, Indiana. Anyone who is purchasing a component stereo system, must ultimately face the problem of selecting his loudspeakers. The electronic components he has chosen may be engineering marvels . . . but they are mute. The loudspeaker is the instrument that finally makes audible the electrical signals fed through the intricate electronic chain, whether they derive from a phonograph record, tape or tuner. The loudspeakers must reproduce the sound of the live music originally picked by the recording microphones in the studio or concert hall. The ideal of course, is a loudspeaker that will reproduce an exact facsimile of the original live sound. There are legions of speakers, each with its claim of approximation to the ideal. Deciding which of these speakers elicits the physiological, emotional, and aesthetic response in a person which constitutes his concept of live sound, is a difficult task. Direct A-B comparison of loudspeakers can simplify the selection process considerably. However, the value of these A-B tests can be much reduced or negated altogether if the wrong kind of music is used in the comparisons or if the sound source is of poor quality. The purpose of this recording is to furnish a standard of reference to aid in the A-B comparison of loudspeakers. As you can see from the accompanying technical note, the recording was produced under "state-of-the-art" conditions. The music derives from that most complex of all musical organizations, the symphony orchestra. The selections were carefully chosen to demonstrate the entire gamut of orchestral sound in the strings, brass, woodwinds and percussion, under varying dynamic conditions. Thus in this recording you have a known source of high quality sound which we hope will make easier your evaluation of loudspeakers, and also give you an enjoyoble musical experience. Worauf sollte man achten . . . . Most loudspeakers are relatively efficient in their reproduction of mid-range frequencies, as compared to their reproduction of bass and treble frequencies. We should note here that efficiency is not necessarily equated with high quality and low distortion. People realize that bass response is the bedrock foundation of the orchestra. They want to hear the bass drums, and tympani, and the contrabasses in proper dynamic relationship to the other instruments of the orchestra. To overcome bass deficiencies in their speakers, many people greatly increase the playback level or add boost with the bass tone control on their amplifier, or employ both adjustments. Unfortunately, the increase in level also affects the mid-range and treble as well as the bass, and the bass tone control affects a series of frequencies, not just a fundamental. The overall result is that the dynamic imbalance remains, and the higher playback levels may mean an increase in distortion. The same situation applies to the treble frequencies wherein lie the harmonics and overtones that give instruments their distinctive timbre and character. A common misunderstanding in the evaluation of loudspeakers is the use of certain types of recordings with very loud dynamic passages for organ pedal or bass drum, which are played at ear-splitting levels, to "show how good the speaker is". Such tests are not relevant to the accuracy of reproduction of the speaker, but are merely an index of how much power at those frequencies the speaker can handle before it begins to distort. Let us examine some of the characteristics of various instruments of the orchestra, how different recording techniques affect them, and how they should sound when reproduced through high quality loudspeakers. Bass drums are made in a variety of sizes. The typical symphony orchestra drum has a frequency of 30-35 hertz, the variation being due to differences in drum head tension. The sound of the drum can be varied by the percussionist using hard or soft mallets, and he controls the dynamics of the drum from the very soft stroke in a pianissimo, to tremendously powerful triple fortes produced by hitting the drum as hard as he can. While a high quality recording can handle almost all of this wide dynamic range, it can vary considerably depending on whether the recording was miked "close-in", or more distant from the drum. It should be noted that there is no use trying to reproduce a 30 hertz bass drum through a loudspeaker, if this frequency does not exist on the disc or tape one is playing. It is a common practice in many recordings to "roll off" the bass response below 60 hertz. There are very few speakers that can actually reproduce the 30 hertz fundamental of the bass drum, or the 27.6 hertz low C organ pedal. Even among this group of speakers, some cannot reproduce these low frequencies without some elevation of the playback level. Not so the Bose 901, which can reproduce the widest dynamic range of low frequencies at average playback levels, and at the same time maintain the dynamic balance across the entire frequency spectrum. A good example of this can be found in several recordings of a number of Mahler symphonies, wherein the composer requires an extreme pianissimo from the bass drum. If this ever-so-soft drum beat has been captured in the recording, the Bose 901 will reproduce it accurately. On most other loudspeakers, unless the listener was following the music with a score, he would not be aware that the drum beat was missing! It should be pointed out that although a bass drum is very low in frequency, it nonetheless has a definite tone. A good loudspeaker will reproduce this tonal quality, rather than the amorphous, soggy, "whump" or "thud", typical of bass drum reproduction on most speakers. Many speakers suffer from resonance peaks in their bass range, which not only blunts the definition of a bass drum, but produces low frequency sounds that aren't even in the recording. An accurate speaker will reproduce a bass drum with a definite "attack" and the speaker cone will be so well-controlled and damped that there will be no "overhang" to make the sound muddy and boomy. In the excerpts on this disc can be found many examples of the various bass drum sounds, from the soft strokes heard in the "Hary Janos" suite, the "Armenian Dance", and the "Love For Three Oranges", to the tremendous blasts in "Gold and the Senor Commandante", and "El Salon Mexico". Note too, the great impact, solidity and weight of the lowest frequency drum on this disc, in the "Love For Three Oranges." We have dwelt with some length on the reproduction of low frequencies, for this is the major shortcoming of most speakers. Let us turn our attention now to other percussion instruments. It might seem a bit odd to consider tympani as instruments in the mid-bass range, but such is the case. Tympani range from about 45 hertz to 125 hertz. They thus have a definite pitch, and we must not forget the pedal tympan which is capable of variable pitch. As with the bass drum, but more so, the sound of the tympani can be varied by striking them with hard and soft mallets, and as occasionally required, with hard sticks. A good loudspeaker will reproduce all these variations and even the distinctive skin sound can be discerned. If the speaker is truly accurate, the tympani will have a clean, sharp, sound of high definition. The attack should be well-defined and immediately apparent to the ear, and there shduld be no resonant overhang. Tympani rolls are very frequently used in symphonic compositions, and a good speaker will articulate every note in the roll. A fine example of this can be heard on this disc in the "Japanese Sword Dance". The piano is of course, a percussion instrument. Here too, the attack is important. In a speaker with good transient response, every note on the piano should be clean and distinctive, without any "buzzing" or "ringing". In the Beethoven "Emperor" concerto on this disc, the arpeggios (quick runs up and down the keyboard) should be completely articulate. A poor quality speaker will tend to blur and blend the notes together. Studies have shown that the peak energy output of a cymbal is in the 8000-11000 hertz range. Surprisingly enough, it was also found there was significant energy as far down as 200-300 hertz. On top quality speakers, when a percussionist clashes a pair of cymbals together you should hear a sharp, definite, metallic attack with little sibilance, and then as the player turns the cymbals outward toward the audience, all the secondary vibrations and modes and the myriads of harmonics that produce the typical "hissy" sound of the cymbal. On cymbals which are struck with a stick the metallic attack is even more pronounced. There are typical cymbal sounds throughout the excerpts on this disc, with very extensive use of them in the "Hary Janos" suite, and the Japanese Sword Dance". The triangle and many types of bells and high percussives, exhibit much the same characteristics as the cymbals. Note the rapidly struck triangle in the "Armenian Dances". A good speaker will reproduce the individual attacks of each note, with no blurring or blending evident. Snare drums have snares of either wire or gut. If the transient response of a speaker is good enough, this difference can be distinguished, with the wire snare sounding higher-pitched and sharper than the gut type. Listen to the snare drums on this disc, particularly in the "Hary Janos" suite, "Gold and the Senor Commandante", "Celebration", and the "Japanese Sword Dance." The woodwind family ranges in frequency from the sub-basement sonority of the contrabassoon to the stratospheric high register of the piccolo. With good speakers, the bassoons, oboes, clarinets and flutes have a smooth mellifluous quality, devoid of any harshness. If the speaker is accurate it will reproduce the distinctive quality of certain woodwinds such as the nasal character of the oboe. Listen especially to the bassoon in "Gold and the Senor Commandante", the mixed winds in the "Celebration", and "Campo di Fiori" sections on this disc. The brass section covers a broad spectrum of orchestral sonority from the "oompah" of the tuba to the high register Bach trumpet. Trumpets should have a bright sound and a great deal of projection and in ensemble they should blare forth with great power. Trombones are bold, assertive instruments, with a tonal palette ranging from the smoothness of an open or muted solo instrument to the rather raucous and even guttural sound of the instrument in its lower registers. The tuba can give vent to stentorian low frequency blasts, which also have a somewhat guttural quality. The french horn is a nightmare to play and a delight to the ear. If the speaker is a superior unit, the horn can be very smooth, with a noble and mellow sound, especially in solo work. In ensemble we get a very broad imperious sound, which is never coarse or harsh. For a rare treat in massed brass sonorities, play the last half of the "Russian Easter Overture" on this disc. Finally, we come to the strings, the "soul" of the orchestra. They often carry the principal melodic line because of their expressiveness. Strings are extremely difficult to reproduce without some type of distortion. On a really good speaker the strings will sound bright but smooth. You will be able to hear the characteristic "guttiness" of the attack as the bow cuts across the strings, yet there will be no stridency or shrillness. The speaker should reproduce the strings with high definition, enabling one to easily differentiate between first and second violins when they are playing in ensemble. The same can be said of the violas and the higher registers of the cellos. The contrabasses are another of the low frequency foundation blocks of the orchestra and while they should have a "gutty" powerful sound, they should never sound coarse. Nor should they be devoid of tone, even in their extreme bass frequencies. On a good speaker definition will be apparent in all registers, with no trace of "tubbiness". When strings are played pizzicato, the attacks should be clean and sharp, the sound free of overhang. Throughout this disc are splendid examples of fine string recording. Especially noteworthy are the first and second strings in the "Pictures At An Exhibition", and the Beethoven "Emperor" Concerto, the entire string body in the "Russian Easter Overture", and the contrabasses in the opening sections of the "Love For Three Oranges." This record contains music with very dynamic and complex passages. Only the highest quality cartridges with their styli in excellent condition should be used to play this record. Anything less, may be unable to track the heavy modulation that occurs frequently throughout the disc.